It is almost impossible to take a newborn baby with you grocery shopping. The car seat carrier doesn’t feel safe balancing on top of the shopping cart seat. Most moms end up placing the entire carrier inside the cart, but then there isn’t much room for food. 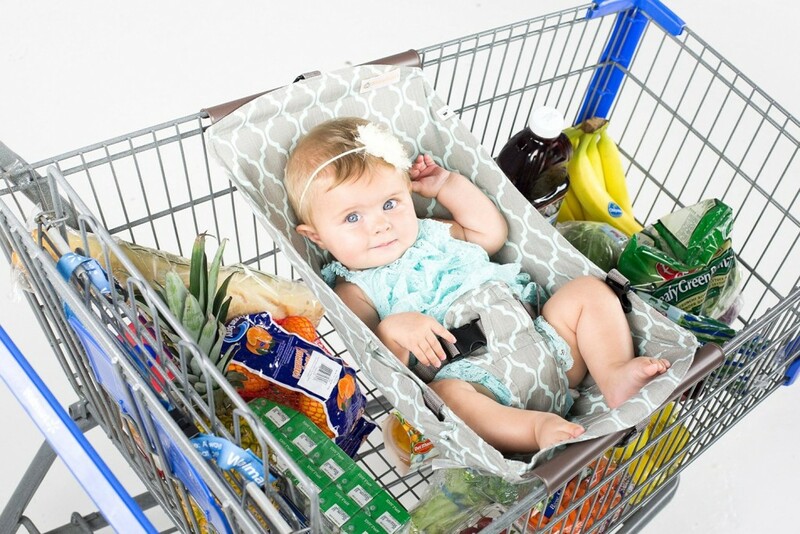 That’s why this shopping cart hammock is a life saver for new moms. It is designed to keep your newborn safe and making shopping easier for you, in this review we will look at the Best, and possibly only Baby Shopping Cart Hammock. Most shopping cart covers are designed for babies and toddlers who are able to sit up in the front of the cart. That leaves you struggling to get shopping done. The baby hammock is different because it is designed especially for newborns. The cart hammock is extremely easy to use. All you do is hook each plastic end over the sides of the cart. Then you fasten the Velcro for extra safety. You can even hook it to the cart with one hand when your other hand is full. The directions say you can place your baby in the hammock or even the entire car seat carrier. Some mothers say they feel safest when they place the baby in the hammock without the carrier. Unlike some cart covers that are bulky, this cart hammock is lightweight and easy to store. It rolls up easily into a compact size that fits right into a diaper bag or purse. This gray and aqua baby cart hammock is made of a comfortable cotton material. You can easily keep it clean by throwing it in a cold water wash and then laying it flat to dry. It is difficult to find a criticism of this baby hammock. The product has an overall rating of 4.9 out of 5 stars. Nearly every mom rates it 5/5 and gives a raving review. In fact, most moms say they end up buying one for every baby shower they attend. The only negative feedback is from parents who wish their child could use it longer. It is designed for newborns up to six months of age, or when they start sitting up themselves. The Binxy Baby Shopping Cart Hammock makes shopping with a newborn so much easier. Your child can rest comfortably while you shop without worrying about pushing a stroller or finding a place for the infant car seat carrier. Once you try it, chances are you’ll love it so much you’ll want to get one for your friends when they have a baby shower.